Today is a special edition pre-Halloween #Giveaway. ! We’re giving away three of that must have eye ball accessory - the finishing touch to every well-costumed face. Any guesses? Lashes. Long, luscious, light MYNK lashes that (when properly taken care of) will last you up to 25 evenings out. MYNK lashes are the ne plus ultra. These crafted-with-perfection pieces are soft, feather light, ultra long lasting and completely hypoallergenic - free from chemical processing and dies. When applied, they look stunningly real. MYNKs come in a variety of styles and thickness (see the full lash-line-up here). 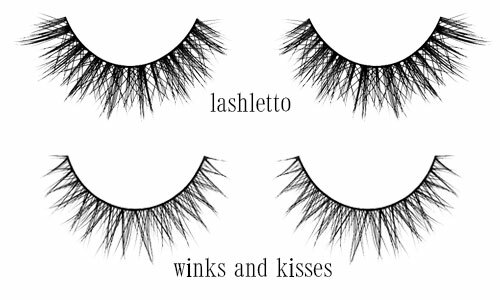 Today we’re giving away two Lashlettos and one Winks and Kisses (shown above). They are full, luscious, and waiting to be the finishing touch for this year’s Halloween costume! Valued at $48 a piece, all you have to do for your chance to wink wearing MYNK is follow the simple steps below. Good luck ladies of lux! 2. Leave a DISQUIS comment below [click through if you are reading this post in your Tumblr feed] and tell me what’s your Halloween costume style … scary, sultry, or sweet? NOTE: Please don’t comment in the ‘Ask Me Anything’ or ‘Fan Note’ area of Tumblr. If you do we will not see your comment and not be able to enter you into the contest! — Please everyone click through and leave a comment on Cult of Pretty itself. 3. You must be 18 or older to enter. If you happen to be under the legal age of 18 you can have someone else enter for you. Just remember that the product will be sent to their attention. 4. This giveaway is for US Residents only - unfortunately we are unable to ship outside of the USA. Sorry! In order to get these lashes to you on time contest ends Friday October 25th at 11:59PM. NOTE: If you subscribe or follow to enter, you must still be subscribed or following at the time of the drawing to win. Multiple comments do not increase your chances of winning.